Whip up a batch of a childhood favorite! 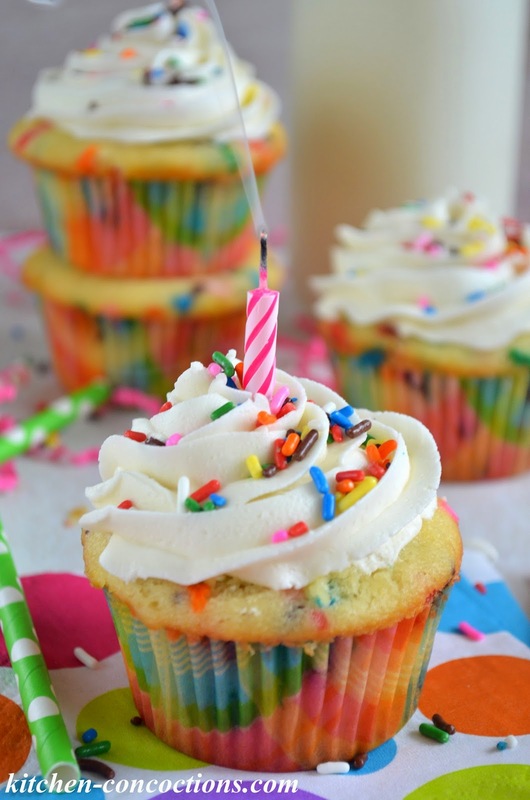 These Homemade Funfetti Cupcakes are fun and festive and perfect for any celebration! That’s how old Kitchen Concoctions is! Can you believe it!?! I know I certainly can’t! No. I mean I really can’t. I can’t believe that I have this little blog of mine. That I have the opportunity to share my voice and things that I love with the whole.wide.world. That I have the opportunity to get up every day and do something I love. Something I am so passionate about. This little blog of mine was started when I needed something to pour myself into. It was started as a hobby but really has turned into so much more. It has gotten me through some tough times through the years. And has also been a place to share some of life’s exciting moments. It has helped me gain confidence and helped push me out of my comfort zone. This blog has blessed me with some fun and exciting opportunities and given me the chance to meet really awesome and inspiring people and make some lasting friendships. I am forever grateful to all of you, who stop by and read my silly stores, make the recipes that I have poured my heart into and leave encouraging notes. And even though this little blog has been a lot more work than I ever imagined, I can’t image my life without it and without all of you! 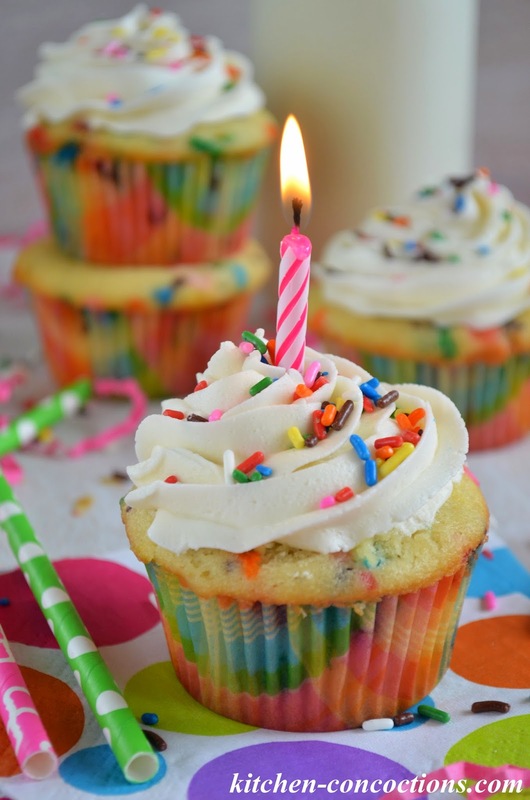 I couldn’t think of a better way to celebrate 6 years of passion, of friendship and dreams coming true, than with the most fun and festive cupcake out there, Funfetti Cupcakes! This homemade version is actually really easy to whip up and tastes way better than the boxed stuff. 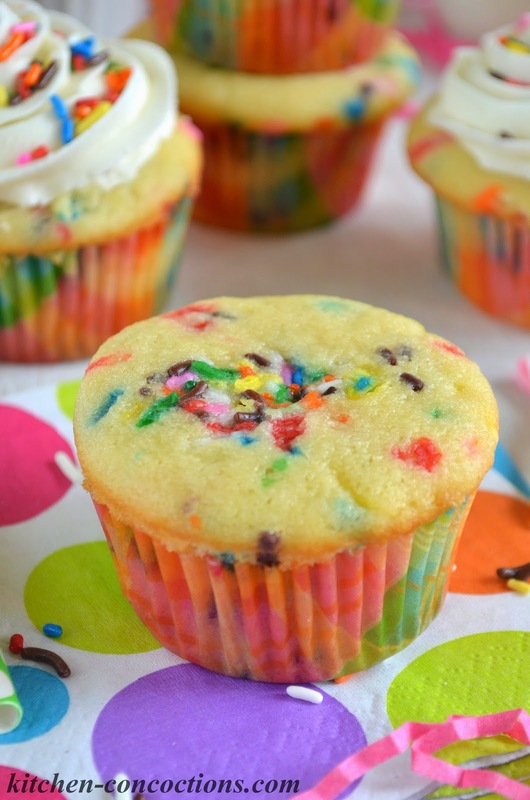 These cupcakes are light and fluffy, are packed with colorful sprinkles and topped with perfect buttercream frosting. And even though I am sharing these cupcakes as part of Kitchen Concoctions’ 6th birthday, I actually made them for a birthday bbq for Eric and 5 friends who all have birthdays within days of each other. Since it was a very special birthday bbq (a few of the friends were visiting from out of state), I wanted a fun and special birthday treat. 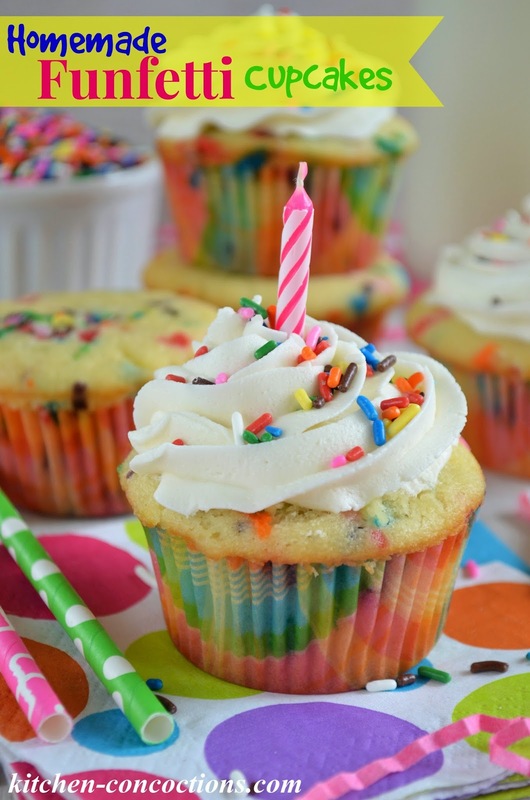 Homemade Funfetti Cupcakes (filled with love and buttah and colorful sprinkles) immediately popped into my head and I am so glad I went with it! They were such a hit, and one of the birthday boys went on and on about how Funfetti was his favorite cake as a kid (little did I know!)! So, happy birthday to all you March blogs and babies! I heart you all! 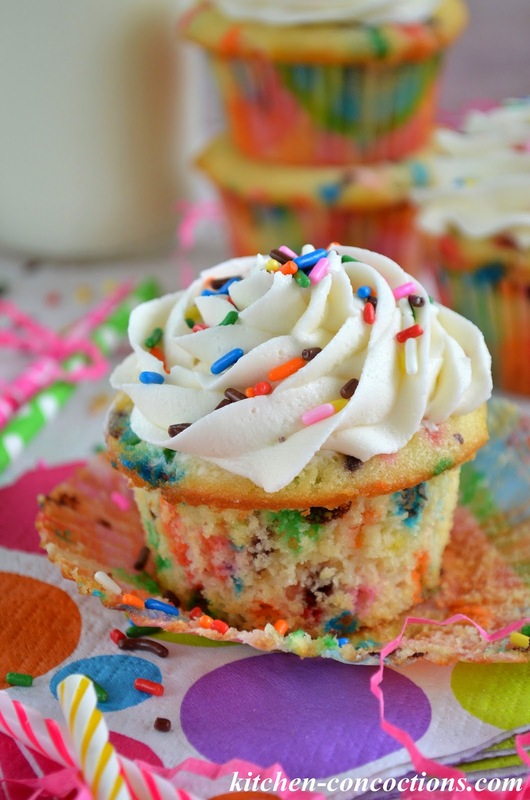 Light and fluffy cupcakes filled with colorful sprinkles and topped with a sweet, creamy frosting. For the cupcakes: Preheat oven to 350 degrees F. Line a cupcake pan with paper liners or spray with cooking spray and set aside. In a large bowl, using a hand-held mixer or stand mixer with a paddle attachment, mix together both flours, sugar, baking powder and salt. Mix together on low speed for 1 minute. With the mixer still on low, add the butter, a few cubes at a time, continuing until all the butter has been added and the mixture resembles coarse sand. In a medium-sized bowl, stir together eggs, egg whites, milk, vanilla extract and almond extract. Keeping the mixer on low speed, slowly add the wet ingredients into the dry ingredients a little at a time, scraping down the sides of the bowl between additions. Increase the mixer speed to medium and beat for 2 minutes, until batter is smooth, scraping the sides of bowl as needed. 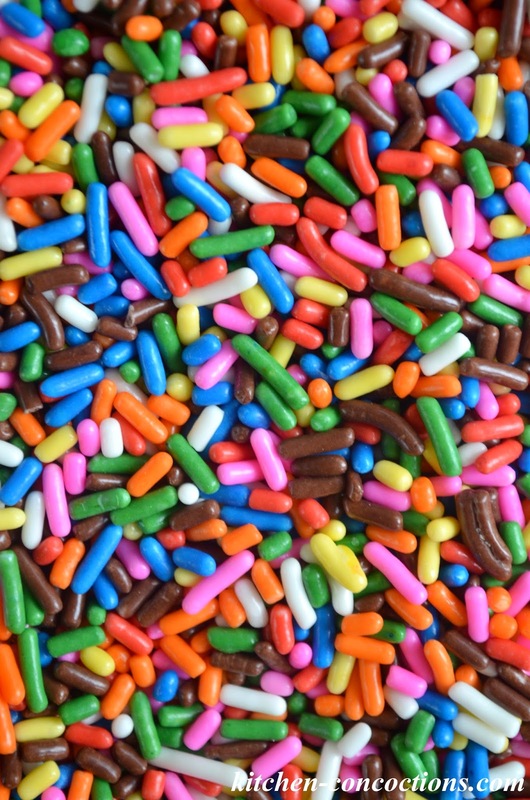 Using a rubber spatula, gently fold in the sprinkles. Fill the cupcake liners two-thirds full (about ¼ cup of batter), using caution not to overfill the liners. Bake for 15-20 minutes, or until the centers are set and a toothpick inserted into the center comes out clean. Cool in pan for 10 minutes, then remove to a wire rack to cool completely before frosting. For the frosting: Using an electric mixer or the wire whisk attachment of your stand mixer, cream the butter on medium-high speed for 5 minutes, stopping to scrape the bowl as needed. Reduce the speed to low and gradually add the powdered sugar. Once all of the powdered sugar is incorporated, increase the speed to medium-high and add the vanilla and almond extract, mixing until incorporated. Add 1-2 tablespoons milk, and beat frosting at medium-high speed until light and fluffy, about 2 minutes, scraping the bowl as needed. Add additional milk or powdered sugar to reach desired consistency. 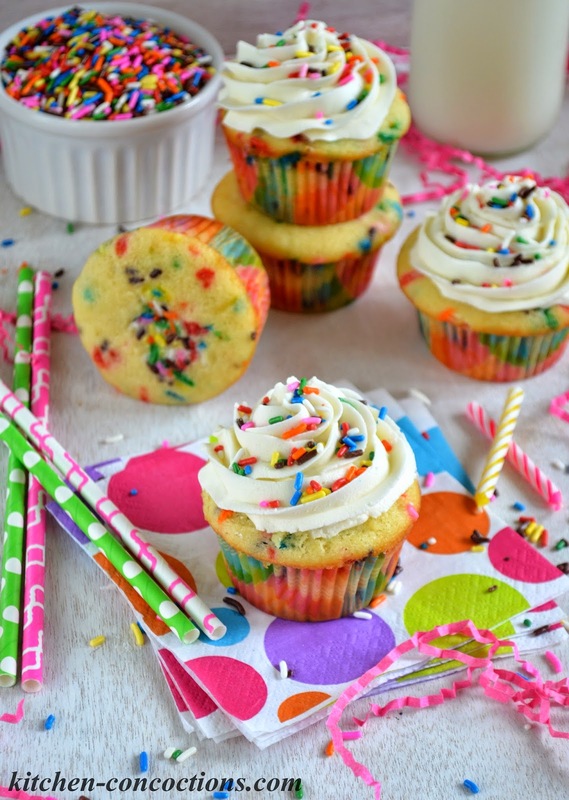 Frost the cupcakes as desired and garnish with additional sprinkles. Frosted cupcakes can be stored in an airtight container at room temperature for up to 3 days and un-frosted cupcakes can be stored for 4-5 days. Store any left over frosting in an air tight container in the fridge.